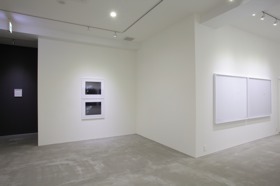 This exhibition displays mainly portrait works produced in 2009 and 2010 together with new photos. 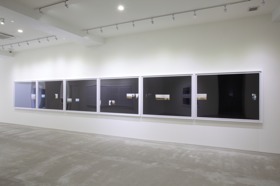 The series of “neither portrait nor landscape” consisting of 6 photos were taken inside a museum so that viewers gradually perceive that the exhibitions and/or people are on a black screen. On the contrary, the series of “outer portrait” on a white screen capture people walking on steps in a museum. Viewers can recognize “something” photographed in a frame at first glance but cannot understand what it is at the moment. Her works therefore require viewers to concentrate, looking at the works in question. This feature lets us experience and observe works for a longer time and thus enables us to stay in a calm and precious time, which we are losing in our daily life. We hope you could find your way to feel her works. Please also note that her third photo book is published in line with this show.